An increasing number of international trade disputes are settled through the WTO dispute settlement (DS) procedure. In parallel, an increasing number of international investment disputes are settled through investor-host state arbitration procedure. What does "transparency" mean in the context of international trade and investment dispute settlement? Why is enhanced transparency demanded? To what extent and in what manner should these dispute settlement procedures be transparent? 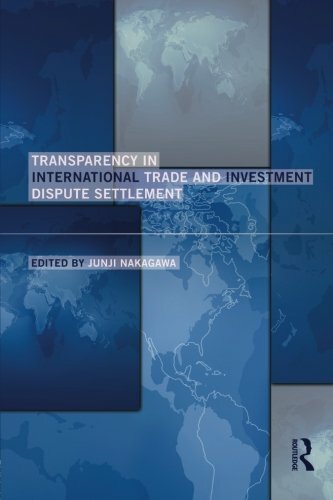 The book addresses these issues of securing transparency in international trade and investment dispute settlement. Transparency in international trade and investment dispute settlement drew attention of international economic law scholars in the late 1990s, but most literature discusses the transparency in trade DS and investment DS separately. The book deals with the issue in a comprehensive and coherent manner, combining the analyses of the issue in both DS procedures and comparing the pros and cons to enhanced transparency in them. The main argument of the book is, firstly, that transparency in these procedures should be enhanced so that they may be accountable to a wider range of stakeholders, but, secondly, that the extent and the manner of transparency might differ in these two procedures, reflecting their structural and functional differences. The bookÂ appeals to both scholars and students interested in international economic law and international relations, as well as lawyers and government officials who deal with international trade and investment regulation. About: An increasing number of international trade disputes are settled through the WTO dispute settlement (DS) procedure.